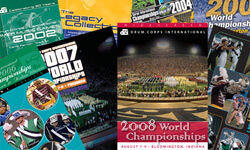 Drum Corps International's "Countdown" is coming to more than 400 movie theaters nationwide on Wednesday, May 13, and in celebration of this momentous event, we're offering you deep discounts on DCI DVDs until May 18! Limited time offer begins May 6, 2008, at 3 p.m. ET. Offer expires May 18, 2009, at 12 p.m. ET. Offer not valid on prior purchases. Offer cannot be combined with other promotions or discounts. Offer good only for purchases made online. Not valid for phone or mail-in orders. Drum Corps International reserves the right to modify or cancel promotion at its discretion.